Red Poll bulls will produce a uniform herd of cattle from any mixed lot of cows. The first cross females will produce more milk than their mothers and the pigmentation virtually eliminates eye cancer when crossed with the white-faced breeds. The breed is noted for its ability to produce a calf each year. With a productive life of up to fifteen years, you can be assured of a large number of calves from each Red Poll female. 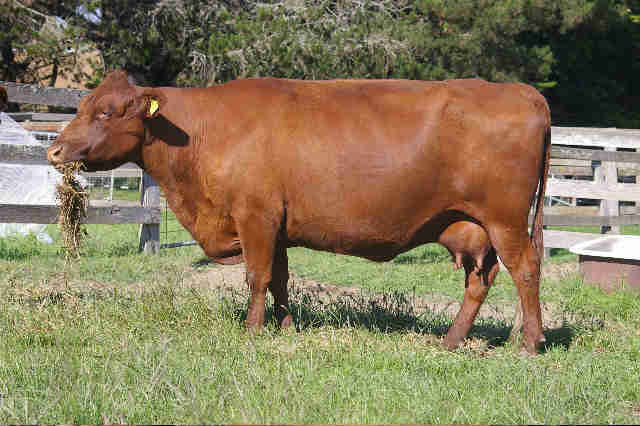 Early maturity of the Red Poll allows heifers to be mated at an early age and to drop a calf at two years of age. The females are noticeably wide across the hips and pin bones and the bulls are not big in the head or heavy in the shoulders. This results in relatively small, quick growing calves. Red Poll females are noted for their high production of milk and butterfat. Together with their excellent mothering ability, good quality vealers can be produced each year. The end point of a beef breeding enterprise is the production of carcases which are suitable for all sections of the meat trade. Butchers recognise the merit of the Red Poll. Success in inter-breed carcase competitions is also proof of these qualities. Feedlot performance is often superior to other breeds. Red Poll cattle are inherently docile and easily managed in small or large herds. Being polled is a tremendous advantage because it reduces bruising of the meat and less injuries to the handlers. The Red Poll is extremely adaptable to a variety of environmental conditions. They are efficient food converters and require minimum supplementary care when run on good pastures. Red Polls have the ability to produce marbling in their carcases. Red Poll cattle are equally suitable for hobby farmers or serious cattle breeders, because they are a medium sized animal with natural immunity to many of the usual cattle problems. They have good temperaments, and are easy to handle.